As a member of the army combat camera team based in Afghanistan, my role is to cover everything that the military does, whether that’s a full-scale helicopter-borne assault, or a female engagement team teaching Afghan women how better to look after their family’s animals. I served 12 years in the RAF as a policewoman, spending time with the army on deployments in Northern Ireland, Bosnia and Iraq. After I left the RAF, I completed a master’s degree in photojournalism, joined the Territorial Army as a photographer, and volunteered to come out with the CCT to Afghanistan. Finding this garden was a complete shock. It’s so unexpected, a flower garden that has been cultivated and grown by local people, in the middle of a military headquarters – Lashkar Gah is the main headquarters for Task Force Helmand, in Helmand Province. The garden was started by some British civilians, about three years ago, and I think the intention was just some flower beds outside the main building. Then three gardeners were employed who decided they wanted their own areas to cultivate, and now there are three gardens within the space. These men have made the gardens what they are; they come in, spend all day working, then quietly go home again. What they have created is such a contrast to the very hot, dusty and sometimes extremely hostile environment of Afghanistan. 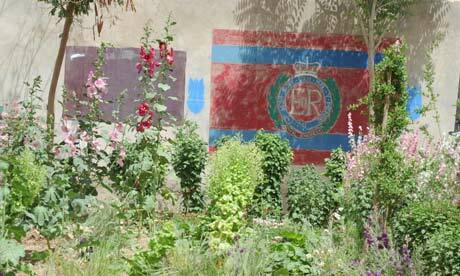 They have planted a combination of local flowers and seeds that have been sent over from the UK. The hollyhocks are pretty impressive - some of them are taller than most of the people on the base – and the roses are startling, because you don’t expect to see an English rose in the middle of Afghanistan.